Dodge Roll has created an excellent game with Enter The Gungeon. It's extremely difficult, but equally rewarding. If there is one genre I have a love/hate relationship with its roguelikes. Spending a half hour exploring a dungeon only to die and have to start over from the very beginning is understandably very frustrating. That said, the pure thrill and excitement of having a good run can’t be replicated anywhere else. Inevitably, what you think is going to be “the run” ends up being yet another failure, but it’s a rollercoaster of emotions nonetheless. That largely sums up my experience with Dodge Roll’s Enter The Gungeon. This bullet hell shooter is very difficult, and quite frankly, I’m not very good at it. I spent hours running my way through the game’s procedurally generated levels only to die unceremoniously at the hands of a boss fight, or just a regular enemy. But you know what? I kept coming back, and with a smile on my face, because I knew that I could do better on my next run. Enter The Gungeon plays like your standard twinstick shooter for the most part. You’ll be using analog sticks to move and aim, and the shoulder button to unleash lead into your (admittedly adorable) enemies. The most importantly mechanic, though, is the ability to dodge roll. Players will be able to leap over flying projectiles and out of the way of foes by using this mechanic. It feels great to leap over a bullet that would’ve caused your death, and it’s one of the game’s key defensive tactics. 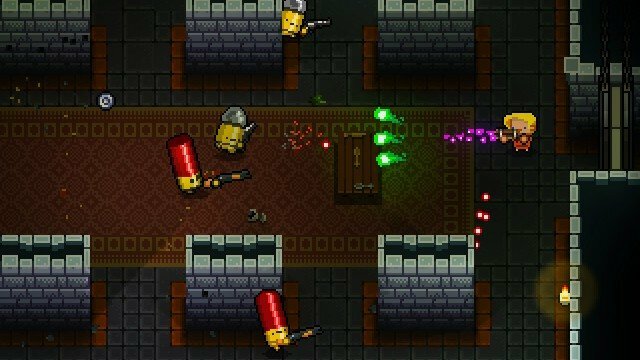 You’ll have to carefully use this dodge maneuver as you explore the aptly named Gungeon, a dungeon filled with enemies that are based off bullets, grenades, and other weaponry. Your goal is to get to the bottom floor of the Gungeon, and that’s far easier said than done. Players will have to explore large Zelda-like labyrinths filled with a variety of rooms. There aren’t puzzles, but there are a ton of enemies that are looking to ruin your run. Battles are intense affairs, and you can never feel too safe. Enemies are smart, and will even flip tables in order to provide cover from your weapons. Every slip up the player makes is a big one, as health is very difficult to come by, as you’ll either have to purchase some from the in-game shop (if they even have it in stock), or hope that they find some (which is quite rare). That creates a tension that never goes away. There is never a meaningless battle since one mistake can cause you to die later on. Eventually players will stumble upon a boss area. It’s there that they have to make a crucial decision: do they go ahead and fight the boss, or do they try to clean up the floor in an attempt to find a better gun. It’s one hell of a risk/reward scenario, and one that has worked out as many times as it’s backfired. I’ve ended up dying from common enemies while trying to explore the rest of the large level, but I’ve also found amazing guns that changed my run for the better. Ultimately, players have to go with their gut and hope they made the right choice. Once they’ve entered a boss fight there’s no turning back. Each area has several different bosses you might fight, so it’s random who you’ll battle once you enter. This randomness makes every run feel fresh since you never know what will come your way, and each boss is so unique that you’ll definitely end up hoping to fight one that you’ve already figured out how to beat. These battles are intense affairs, and often soul crushing ones. You might want to cry after losing a 27 minute run to a giant tank, but you also know that it’ll be so satisfying once you beat them. If you do end up succeeding, you take an elevator down to the next floor where you do it all again against more difficult enemies. According to Enter The Gungeon‘s trophies, there are five chambers in all. That might not seem like a lot, but once you’ve died on the first chamber for the 50th time you’ll eventually learn that it does ask a lot out of the player. 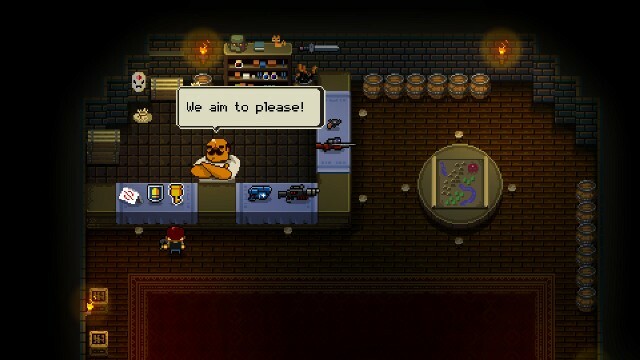 As you inch your way and make progress, you’ll eventually be able to purchase more powerful guns that will spawn in the Gungeon. This is enough to give players a semblance to hope that someday, with enough perseverance, they’ll be able to clear all five stages. Dodge Roll has clearly developed a game that is built around replayability, and failing repeatedly, so thankfully there’s a lot that keeps Enter The Gungeon feeling fresh. There are over 150 different weapons to find (that range from ridiculous T-shirt launchers to more dangerous weaponry), and a ton of different one-time use items that players can play around with. These can single-handedly save a run from failure if used correctly, but there’s so many that you’ll have to learn how to use each one over time. There’s always something new to learn or see, and that’s what makes the experience so special. Rounding out the package is a local co-operative mode, which is better in theory than execution. Since both players share the same screen, it greatly limits movement. I’m sure some skilled players will be able to overcome this limitation, but it ended up making my runs more frustrating than fun. 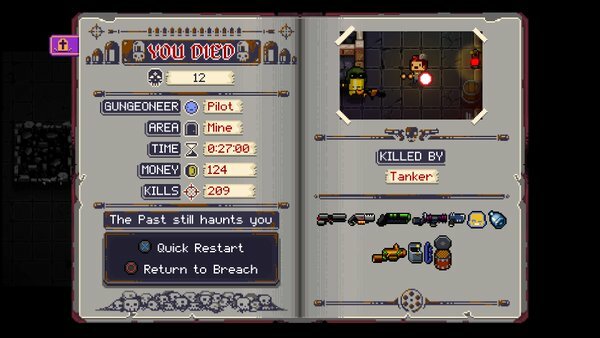 Enter the Gungeon joins Nuclear Throne as a must-have roguelike on PlayStation 4. Dodge Roll has created a wonderful game here that is as punishing as it is satisfying. You’ll die, you’ll swear and you’ll throw your controller, but it’s all worth it in the end. Because eventually, you’ll have that one special run that culminates in triumph. Or you’ll just die again – but it’ll still be fun!